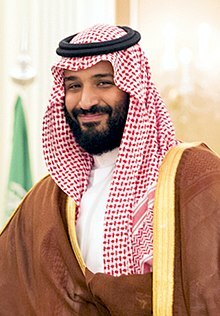 Mohammad bin Salman bin Abdulaziz Al Saud (Arabic: محمد بن سلمان بن عبد العزيز آل سعود‎; born 31 August 1985), an aw kent as MBS, is the Croun Prince o Saudi Arabie, First Depute Prime Meenister o Saudi Arabie an the youngest meenister o defence in the warld. ↑ "Muhammad bin Salman cracks down on his perceived opponents". The Economist. 21 September 2017. ↑ "Mohammad bin Salman named new Saudi Crown Prince". TASS (in Inglis). Beirut. 21 June 2017. Archived frae the oreeginal on 22 June 2017. Retrieved 22 June 2017. ↑ "Mohammed bin Nayef kingpin in new Saudi Arabia: country experts". Middle East Eye. 1 February 2015. Archived frae the oreeginal on 3 February 2015. Retrieved 1 February 2015. This page wis last eeditit on 27 Februar 2018, at 09:59.